The affordable luxury sedan is undergoing testing as Hyundai prepares a second-generation model. After seeing the next-generation Genesis testing its new four-wheel drive system on the snow and ice in Sweden, Hyundai has been caught putting another Genesis prototype through its paces at the Nurburgring. Although the model arrived at the Ring wearing plenty of camo, it’s clear the prominent grille will ape that of the HCD-14 Genesis concept. On closer inspection we can also make out sweptback headlights, wraparound taillights and a dual exhaust. 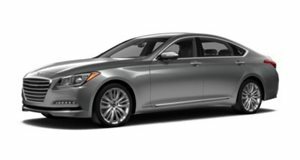 The second-generation Genesis will be powered by updated versions of Hyundai's 3.8-liter V6 and 5.0-liter V8, both mated to an 8-speed automatic transmission at launch, with a 10-speed slush-box to arrive sometime later. There should be plenty of opportunity to see the 2015 Hyundai Genesis progress throughout the year, as the car is tipped to debut at the 2014 Detroit Motor Show.